You are visitor...# who's entered the Ascot site. Click on thumbnails for a larger picture! Click HERE for the VT sound. 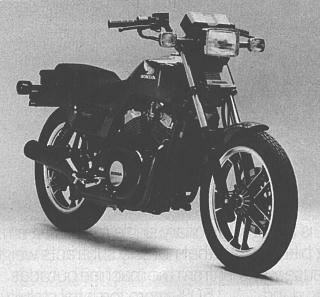 The Honda Ascot VT500 was produced only two years, 1983-1984, as a cycle for those who didn't want a cruiser or the new Interceptors. 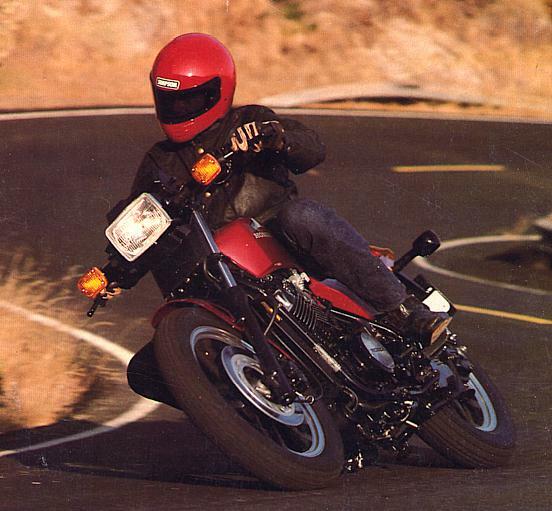 Honda's CX500 was another choice as a 'half-liter' bike, however, '82 was it's last year in Honda showrooms as a 500cc bike. 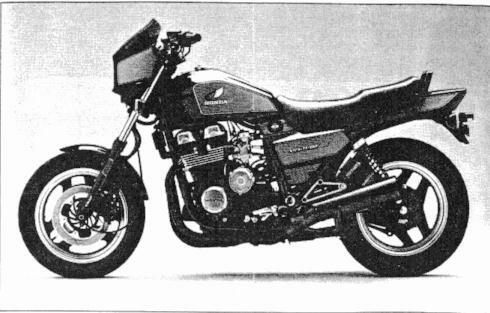 The CX500 became the CX650 for only one year in 1983. 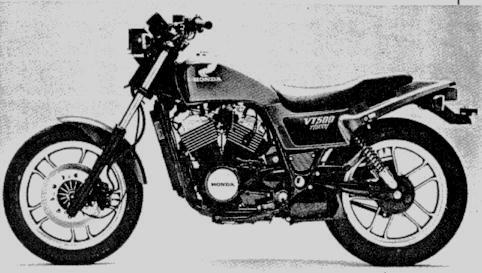 The VT500 is a transversely mounted V-twin, 500 cc's, on a sport frame. It's physical characteristics are shared with it's cruiser counterpart, the Shadow 500. Click here to view the Ascot with the Shadow. Essentially, the two bikes are alike except for only a handful of differences. The frames are alike but on the Shadow, the foot pegs are mounted forward and the seating position is lowered. The Ascot has a straighter handlebar than the Shadow, along with a larger diameter rear wheel for cornering stability. 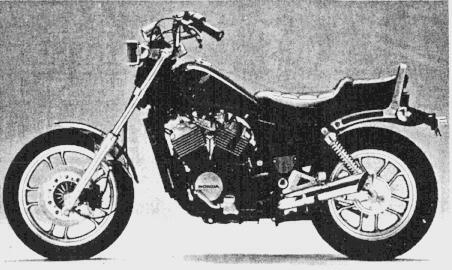 The engines appear to be identical except for the Ascot having a shorter gearing in the rear end, designed more for the performance end of riding and to compensate for the larger rear wheel. The Shadow has dual mufflers while the Ascot ports all of its exhaust out one muffler. The styling cues differ greatly but complement each bike individually. Cruisers look good with chrome. The Shadow has lots, all the way from the mirrors to the mufflers. The Ascot emphasizes it's aluminum parts more by painting much of what's chrome on the Shadow, black. 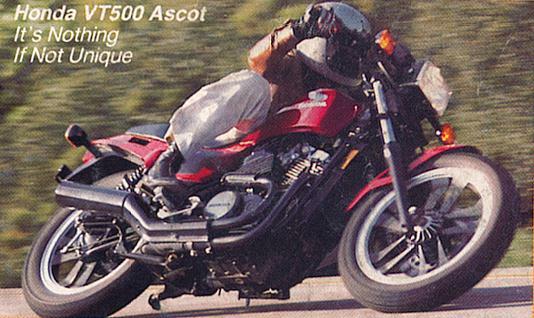 The Ascot shares many of it's design cues with the Nighthawk counterpart, the 700S. 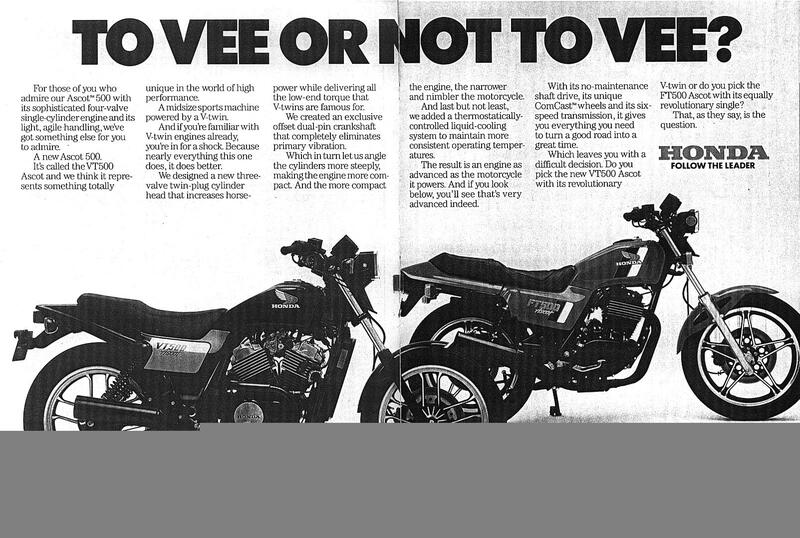 You could actually say it the other way around since the 'S' didn't come out until a year after the introduction of the '83 Ascot VT500. Click here two view the Ascot with the Nighthawk 700S. There were two color schemes offered each year made. Pearl Siren Blue and Candy Burgeone Red were 1983 colors, while for 1984, Candy Red was still offered but Pearl Blue was replaced by Black. 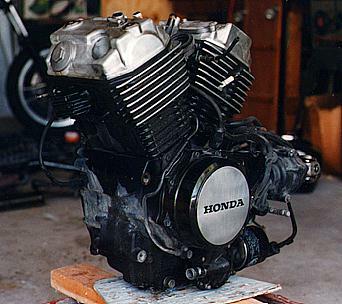 Another difference between '83 and '84 models was related to the engine; supposedly '83s sported 32mm carbs while the '84 models came equipped with 34mm carburetors. *(I've yet to confirm this)* Honda initally used one piece exhaust valves but because of the heat that is generated from combustion, Honda switched to two-piece exhaust valves because of lower expansion rates. This improvement came out for '84 and newer models of the VT series (Shadow included). As it sits, the engine's claimed weight is 141 lbs. Click here to sample my VT's sound. I recorded it on a Sony Mini Disc portable recorder, MZ-1. However, to keep the size of file reasonable, I had to transfer it at 11K sampling rate at 8 bit mono onto the computer. It still captures the correct sound though. You'll notice the muffler gives a raspy tone when up near red-line. It actually sounds awesome when riding it hard on the road--very similar to a screaming V-8! Click here to compare the sound of a CX500. Read more about the CX500 on the Related or Similar Cycle page. 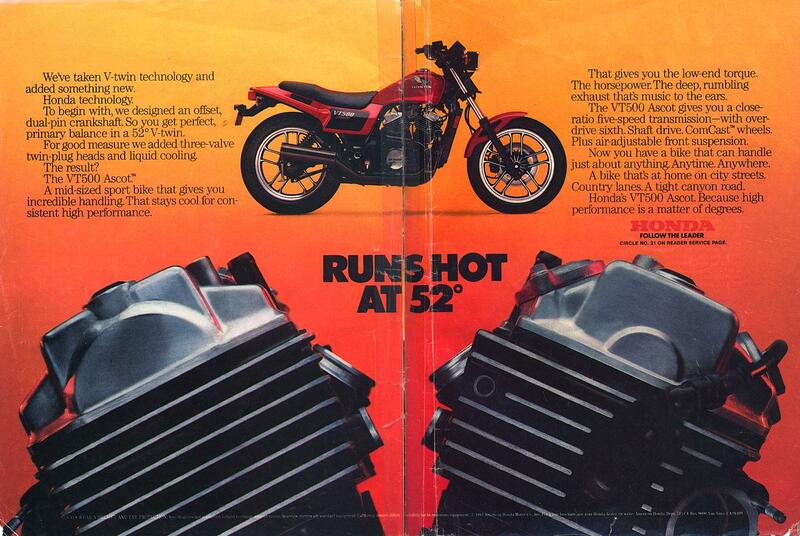 The same VT engine which premiered in the Shadow and Ascot is still in production today. 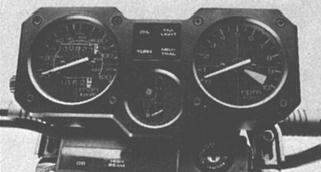 Two major engine design changes occurred with the introduction of the Hawk GT 647 in 1988 and the Shadow VLX 600. Essentially most of the engine has stayed the same except for bore, stroke and cosmetic updates. The Hawk GT was dropped from the lineup at the end of the '91 model year. 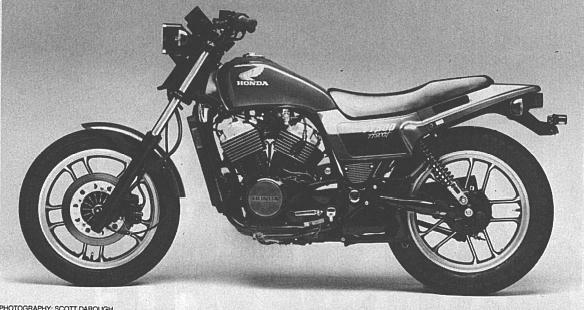 The VLX is still offered to this day as proof of Honda's solidly built VT engine. This head featured two smaller intake valves and one larger exhaust valve. 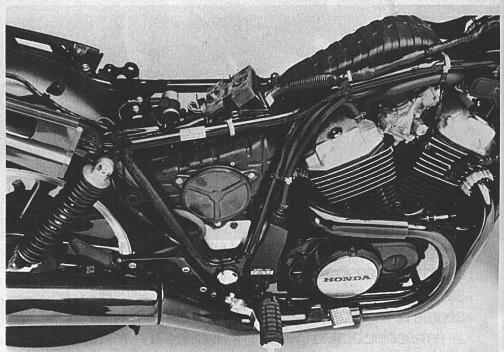 Honda first used this three valve technology on the 400 Hawk, a successor to the 305 Hawk. Ignition is slightly retarded because of two plugs firing instead of one, the mixture is ignited at a faster rate providing a more complete combustion. Also, a built in squish area causes a small amount of fuel mixture to swirl on intake. The end result, Honda was able to up the compression and emissions were greatly reduced so much, that California models did not need a catalyst, but still utilize emission components that capture fuel tank gases much like the emission canister on your car. Notice the heart shaped dome on the pistons. Honda used a one piece crankshaft which is stamped from a billet of steel using a 6000 ton hot-forge press. Honda also came up with a mathmatical equation to accurately calculate offset crank pin location for any vee angle for perfect primary balance. With Honda's new technology, this eliminated the use of a balancer which can add weight and rob essential horsepower. The Shadow was and still is a very popular cycle of choice. The Ascot VT was not as popular and probably had much to do with its cancellation of production. 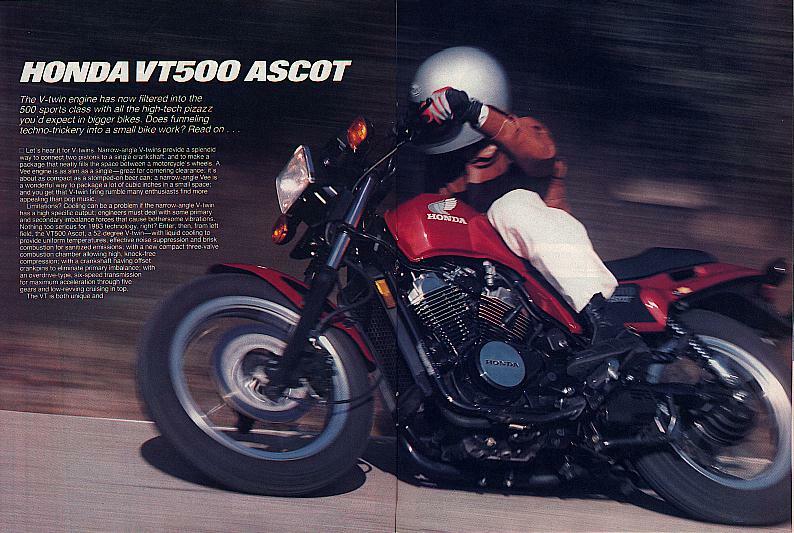 People either wanted a cruiser or something much better performing that what the Ascot VT could offer for its price. Compared to other twins produced at the time, the Ascot was far superior due to its no-mess ignition, no-fuss drivetrain, and never-worry liquid cooling, not to mention the significant power it produced compared to similar-sized twins. However, its price was more than what simple twins cost at the time. Four cylinder bikes of the same era were incredibly quick and fast, and for the same relative price point. Also, the comfort level and load capacity left little to be desired. Its suspension was adequate but not complementing to what performance the engine could produce. However, being a narrow, lightweight cycle with plenty of power on demand with no awkward power curves, it did perform well enough to give many smiles per mile on backroads or around town. The Shadow was best suited for distance traveling because of its laid-back seating position, larger fuel tank, fatter rear tire, wider seat, and slower turning engine for economy. That too was destined for short duty use as was its relative, the Ascot, because it was too small to carry much cargo and the Shadow's engine bogged under slight loads due to it's tall gearing compared to the Ascot's.